You know that funny TV commercial where the office gopher pops its little head up all over the place in a large maze of cubicles? That’s just what I felt like when we assembled late last Thursday afternoon for Carole Ohl’s hubby Daved Levitan to take a group photo of the graduating class of October 2011, 7th Zentangle® Teacher Certification Class, in Providence RI. I’m in the very back row on the left side in front of the ventilation grate (in the pink circle) – and I wasn’t quite as tall as several of the folks in front of me, so I kept popping up on my tippy toes. Felt just like that little gopher! Good thing Daved’s camera took a zillion rapid-fire shots as I’m pretty sure I disappeared completely in a few of them :-). Here we are with Rick and Maria, front and center. As Rick writes, this is “one amazing group of talented and passionate individuals!” I second that emotion. Our classroom (the Ballroom of the Hotel Providence) had display tables across the back for classmates to share their Zentangles and Zentangle-inspired art (ZIAs). There was a LOT of beautiful eye-candy there and one of the most popular items was Sharon Payne’s tangled high-heeled sneakers, which she’s sporting in the front row of the photo. We egged her on to wear them until she finally gave in and put them on for the photo, check them out. Amazing, right? Just wonderful, Sharon! And you wear them well! Wish I could have been there. But what a bunch of you there were! Welcome, Nancy! If I’m not mistaken there are 103 new CZTs as a result of this training class, some from as far away as South Africa, Japan and Australia. It’s quite the group! And BTW, the list of CZTs on the Zentangle® website hasn’t been updated yet as I’m sure Rick is overwhelmed with post-seminar details. I will let everyone know when we’ve all been added so you can check your local area. I just began practicing this art form in April and I am totally hooked!! Wish I could have attended this seminar – especially since I live 12 minutes away!!! Maybe next time! In the meantime, I will keep practicing and using my imagination to the fullest! Congratulations to all of you on being certified. Must have been a great time of learning and making new freinds and tangling! I’m looking forward to the list and hoping that there is someone from South Australia among the list. Have been drawing for a few months but need a teacher. I wondered where you are, Sally! Where were you standing??? My Mum found me in the pic – just barely showing. About three rows in front of you and over another three faces. I would never have seen it without my Mum’s help. She said she would know me anywhere! 🙂 You can’t see much, but at least I know I was there! Oh wow, thanks for posting our picture, Linda. It was fun to enlarge it and really get a good luck. I don’t know about you, but I’m still on cloud nine from the workshop! It was just that great and I highly recommend the experience to anyone thinking about going to the next one. And, I just booked my first class about an hour ago. Yahoo!!! Thanks again for your posting, Linda, and it was an absolute pleasure to meet you and Rob at the workshop. Wow! What a huge class! Congrats to all. 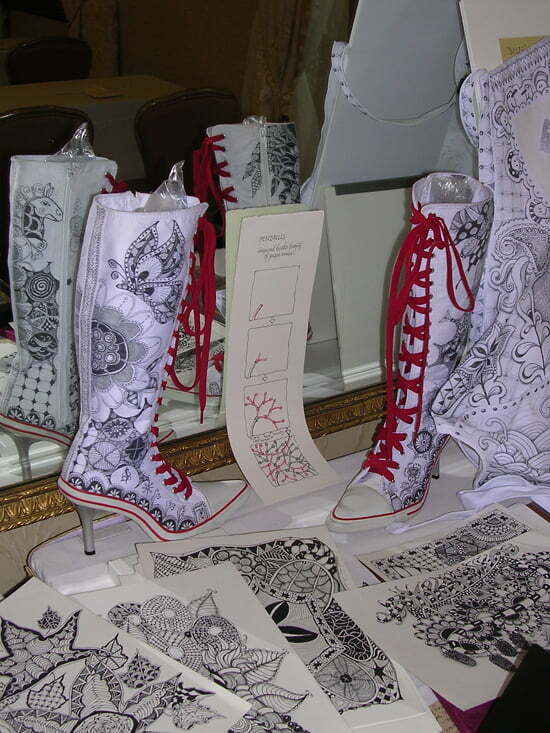 Zentangle® Teacher training only takes place in Providence, Rhode Island, and it is TOTALLY worth the pilgrimage. If you are committed to being certified, you will go. Generally classes are held 3 times a year and though they are not open for registration yet, the dates for 2012 have just been announced: February 21 – 24, August 14 – 17, and September 25 – 28. I will let everyone know when registration opens. Check the list of CZTs on the official website for teachers in your area: http://www.zentangle.com/teachers.php – it hasn’t been updated with the new class yet.